James is in his 24th year of coaching volleyball in Oklahoma. 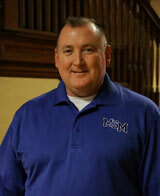 He is the Head Coach at Mount St. Mary High School. James has also coached at Oklahoma Bible (2006-2015) and Enid HS (1994-2006). His high school teams are on a streak of 14 straight years of making the State Tournament. He has won 2 State Championships and has 4 Runner-Up finishes. He has also had two club teams win Regionals and qualify for Nationals while he was a coach and director for Enid Evolution Volleyball Club. James has had 23 players named All-State and 91 players have gone on to play in college. James and his wife, Marci, have 3 boys: twins, Jadyn and Jaxyn, and Gabriel.